We are people of the Book. We love the Bible and want its truth on our lips and in our hearts. 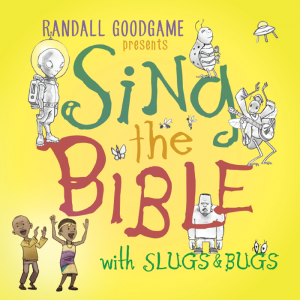 Our kids have been singing the Word of God all over our house since we got our copy of Sing the Bible with Slugs & Bugs. It’s deeply satisfying to Gina and I to know our kids are storing up the treasure of God’s Word in their hearts. The music on this album is phenomenal. A lot of family/kids music is hokey, repetitive, irritating, and worst of all, “canned.” Randall Goodgame is an incredible musician and has brought together a team of brilliant musicians, including Grammy-riddled banjoist Ron Block (of Alison Krauss and Union Station fame), Andrew Peterson (of Inkwell fame), Eric Peters (of Book Mole fame), Buddy Green, a bunch of great kids, some monsters, some bees (trust me), and a host of others. Most fun of all, the African Children’s Choir out of Uganda lends its talents to the record. This is the real game-changer. Having spent a lot of my childhood in Africa, and the rest in Appalachia, this music is the real deal. It’s melodic folk-pop with a perfect dose of African rhythms (think Paul Simon’s Graceland) and a hint of bluegrass. It’s musically marvelous. It’s got some fantastic humor. I know, I know. It’s kind of hard to see how that’s possible when it’s an album of Scripture songs. I don’t want to ruin any surprises, but just trust me. Like all the other Slugs & Bugs recordings, this one has moments of pure hilarity. One such moment includes an appearance by the wonderful author of The Jesus Storybook Bible, Sally Lloyd-Jones. What I may love most about this and – all the Slugs & Bugs music – is that our entire family loves it. I’m 37 (the oldest), Norah is 2 (the youngest), and there are 4 people between us. We all genuinely like this record and enjoy listening to it over and over. It’s not just kids’ music. It’s family music. My goodness, Randall Goodgame’s heart. Randall is a friend of mine, though I was a huge fan of his Slugs & Bugs before I knew him. But knowing him and hearing his heart… this is a person you want speaking into your kids’ hearts. This is a man who loves God, loves children, and has big dreams about how to serve families with music. If I could borrow a batch of Randall’s holy, happy, hearty enthusiasm and imbibe it every day, I would. I love this man and I love what he’s doing. I think you will too. These 5 Reasons were originally published at For the Family. If you weren’t paying attention because you were swept up in the pure fun and singability of the songs, you might miss the outstanding musicianship that’s crammed into every song on this album. So, so good. Some of the songs on this album are personal favorites of mine. Not personal favorite kid songs, mind you. Just plain favorites. And also, my kids learned the Old and New Testament in about 15 minutes thanks to this album. Fantastic stuff.